to fuel the energy revolution. 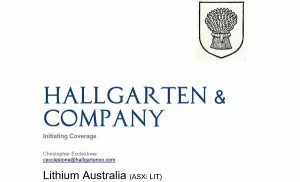 Perth-based Lithium Australia NL (‘LIT’) aims to supply ethically and sustainably sourced materials to the battery industry worldwide. To that end, LIT has developed disruptive extraction technologies – including its proprietary SiLeach® process – and secured positions in lithium provinces around the globe, including Western Australia and Europe. LIT takes the view that sustainability equates to viability with respect to both the manufacture and disposal of lithium-ion batteries (LIBs). Indeed, LIT believes discarded electronic/battery waste may ultimately prove the most cost-effective and environmentally friendly source of the so-called ‘energy metals’, among them lithium and cobalt. LIT’s plans for ‘closing the loop’ on the energy-metal cycle involve the following. Energy-efficient recovery of lithium from mine waste to create primary battery chemicals. 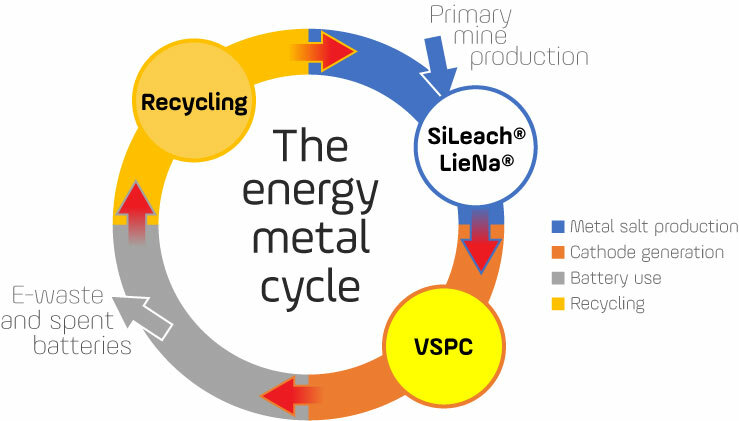 Conversion of those primary battery chemicals into high-spec cathode materials via VSPC Ltd. Recycling of energy metals from spent LIBs and alkaline batteries, via Recycling and VSPC. 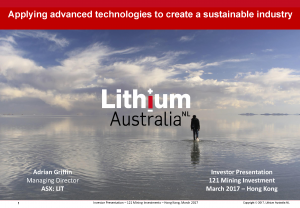 In summary, LIT’s lithium resource inventory and disruptive processing technologies provide it with a sustainable, ethical and vertically integrated supply chain.